In a snippet from the recent Prime Time special on NAMA, the RTE film crew caught up with the NAMA chairman, Frank Daly and NAMA CEO, Brendan McDonagh just as they were about to present the first NAMA annual report to the media. Whilst waiting to go into the press conference, RTE asked the NAMA CEO what he expected to be asked by the media and his reply, with a cheeky smile, was along the lines of how come NAMA has been so successful in generating cash! And the NAMA CEO is correct – the agency has generated a mountain of cash with some €4bn of disposals/refinancings of loans and assets. It makes NAMA a cash-rich organisation. Remember though that this is a temporary cash-flow blip; in the long-run, NAMA will come under pressure to sustain its cash as it starts to dispose of more difficult properties and loans. Just to illustrate the difference between profit and cash : if you operate a fruit stall and get €1,000 of fruit from the fruit wholesaler and give him a €1,000 IOU in return, and you then sell all of the fruit on your stall for €750, you will be cash rich and you can give the fruit wholesaler €500 and you’ll still have €250 left over. The thing is, the fruit wholesaler will eventually want his remaining €500 and you won’t have it. Also you’ve made a €250 loss because your sales were only €750 and your costs €1,000. But for a while you might be cash rich. The same applies to NAMA; but NAMA still has a stock of properties and the values might increase, so there is the possibility that NAMA might still break-even, or perhaps make a profit even though it made a loss of €1.1bn in its first full year of operations. This afternoon NAMA issued a press release in which it says that it has redeemed another €500m of its bonds. These are the bonds – IOUs created by NAMA – which were used by the agency to buy loans from the banks. The banks had tended to exchange these IOUs for cash at the ECB which brings real cash into our economy. NAMA pays a low interest rate on the bonds – approximately 1.7% per annum. To date NAMA has given the banks around €30bn of these bonds plus another €1.5bn of so-called subordinated bonds which will only be honoured by NAMA if the agency makes a profit over its lifetime. So what has happened is NAMA has redeemed €500m of its outstanding bonds, paid the banks €500m in cash, the banks have paid the ECB €500m and received the collateral of the NAMA bonds which are finally handed back to NAMA. I hope that’s clear! The latest €500m redemption brings to a cumulative total of €1,250m of NAMA bonds that have been redeemed by the agency, all since the start of this year. The agency has to redeem all of its bonds by 2020 and last year announced a self-imposed target (a target not to be found in the IMF memorandum of understanding, contrary to some claims) of repaying €7,500m by the end of 2013 – 27 months hence. The early redemption of this bonds has been criticised on here before because it is felt that €500m sitting in NAMA’s bank account is better than it sitting with the ECB. Of course if NAMA can’t find a use for the €500m, then better that it be repaid; but given that the annual interest charge is 1.7%, you might have thought that NAMA could have put this cash to better use than just handing it back to the ECB. To date NAMA has approved approximately €900m of additional advances to developers of which less than half has been handed over in cash. It was recently reported that NAMA was making €10m available as a loan to Fingal council to help fund a road in west Dublin. UPDATE: 22nd September, 2011. NAMA has now put the press release announcing the latest bond redemption on its website and it is available here. In April 2011 the Irish Times reported that the developer of the high-profile Belmayne development in Coolock/Balgriffin, north Dublin was in NAMA. 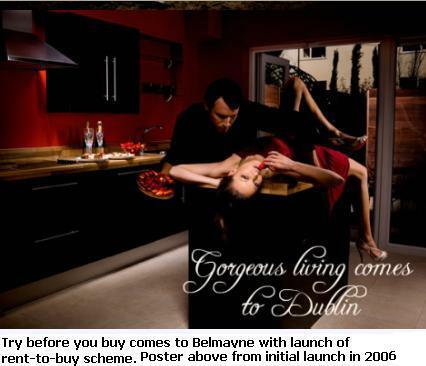 In the mid-2000s, Belmayne Ireland Limited had plans to develop a €1.2bn 2,650 residential unit mini-town, but plans were overtaken by events, and by 2009 when the market was crashing, only 600 units had been built and reportedly only 370 of these had been sold. The development was launched in September 2006 and became associated with the brash peak of the housing bubble, with posters of evening-gowned temptresses draped seductively over every-day household furniture. Prices in the development have been progressively falling and two-bedoom apartments with asking prices of €330,000 in 2007 appear to be on the market today for €149,950 (55% off). Three bedroom units seem to have dropped from €460,000 to €189,000 (59% off). The development company is probably most associated with Donal Caulfield and Leo Meenagh. Rent to buy schemes have been popular in the past as they allow purchasers without deposits or credit to trial a property over a period of time which also allows them build up a deposit or obtain credit. A common criticism of such schemes is that the headline prices are inflated to take account of the developer’s risk and inconvenience; after all, in the above example, the developer might accept €120,000 cash today rather than become a landlord for two years with the possibility that the potential purchasers cannot, or will not, proceed in two years. In total there appear to be 10 apartments for sale under this scheme with a mix of part-furnished one-bed (here on DAFT.ie), two-bed (here on DAFT.ie) and three-bed (here on DAFT.ie) units. From the point of view of NAMA’s sales tactics, the rent-to-buy scheme is an attempt to deal with an absence of credit for mortgages, plus a reluctance on the part of buyers to do a deal now when the outlook for property prices looks bumpy. Separately, another one of NAMA’s tools, its negative equity mortgage product, is expected to be launched shortly. The Roscommon People last week reported that a number of “prime investment properties” in Athlone (County Westmeath) and Ballinasloe and Tuam (both County Galway) were coming on to the market. Today the Irish Independent does some yield analysis on last week’s report and writes that “the properties are all part of a portfolio owned by a west of Ireland developer who is working with NAMA to pay down his loans”. (1) Dunlo Centre, Dunlo Street, Ballinasloe. 8,500 sq ft with the ground floor rented to Ladbrokes bookmakers. The developer of the Dunlo Centre in 2006/7 is recorded as Gerry Sweeney, Declan Sweeney and Paddy Sweeney, Mother Hubbards, Bride Street, Loughrea, Co. Gaway. Paddy Sweeney has been associated with Tom Considine and Gerry Prendergast who, all together, have been reported to be in the NAMA Top-20. They are most associated with the development of theMillenniumPark in Osbertstown in Kildare. You’ll find rent details for the above properties in the Roscommon People report. The Independent has some yield analysis suggesting yields in the 10-16% range. What is not mentioned anywhere is the potential impact of what seem like imminent changes to commercial rent legislation with the retrospective abolition of Upward Only Rent Review terms. The latest news on the controversial piece of legislation is probably from the horse’s mouth yesterday when Minister for Justice, Equality and Defence, Alan Shatter told the Oireachtas that the Government has committed to introduce the Landlord and Tenant (Business Leases Review) Bill before Christmas 2011 and he indicated it would be published in “late October/November”, that he, Minister Shatter was liaising closely with the Attorney General on the legislation which may need to be approved by the Troika. The Minister indicated that there were still technical issues, particularly in the area of property rights. He said the Cabinet had been informed of progress and that discussions had taken place with interested parties.